So, what I’ve been hearing lately is that you must go to France to experience the perfect roast chicken… while it seems like a perfectly legitimate excuse to go to the land of love, I’m not buying it. You can make a delicious roast chicken right in your very own kitchen. 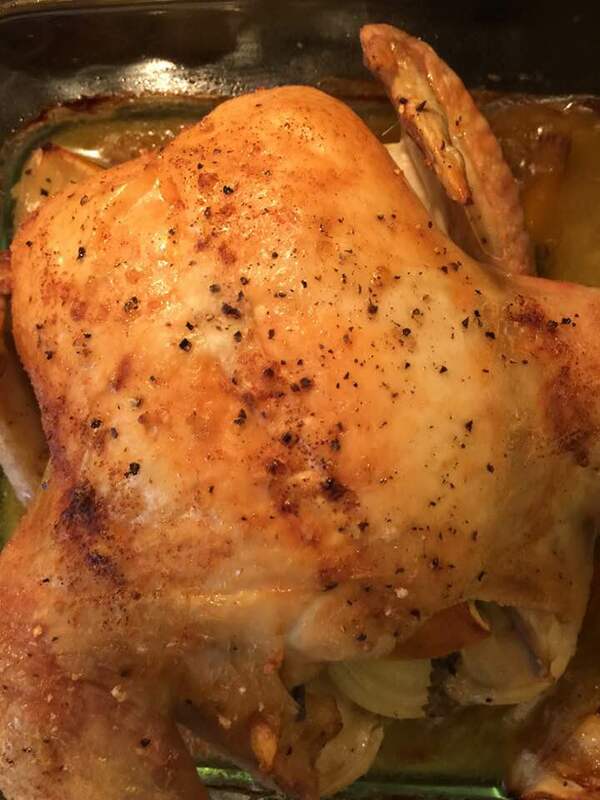 What I love about roast chicken is you can dress it up or dress it down, kind of like a good pair of heels… You can serve it to company with some pretty roast vegetables (think brussel sprouts, sweet potatoes, red onions, and herbs) to go with it, or you can make it on a Tuesday for your family alongside some mashed potatoes. It’s a classic dish. Take your herb sprigs, veggies, garlic, and lemons and make a bed for your chicken. (I’ve used a cast iron skillet, 8 x 8 Pyrex, or you can use a roasting pan.) Reserve about one sprig/piece/slice of each to shove in the chicken’s cavity. 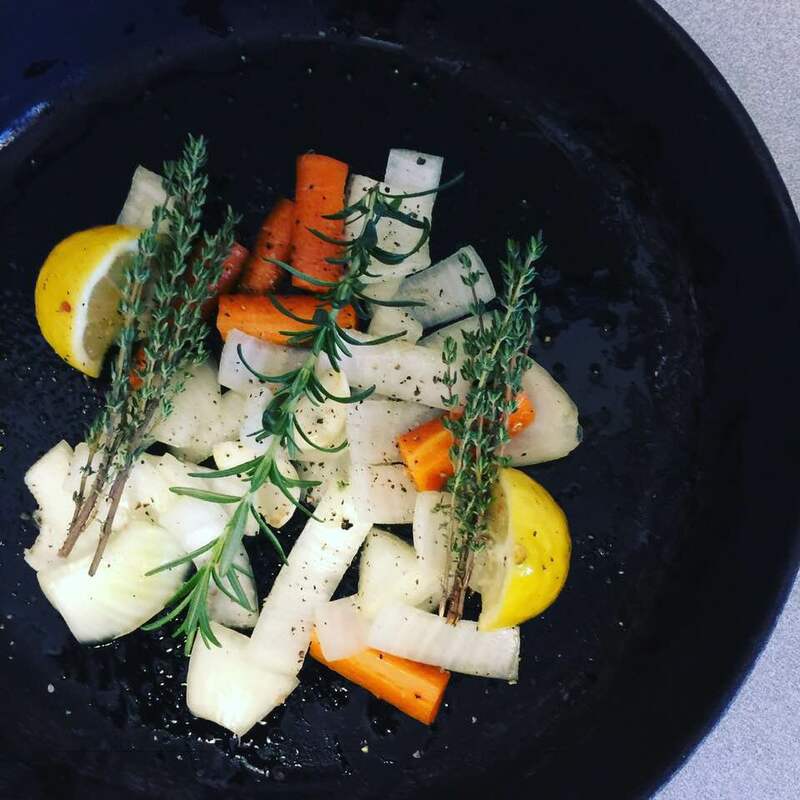 Pour a little olive oil on top of your bed of aromatics and season with salt and pepper. 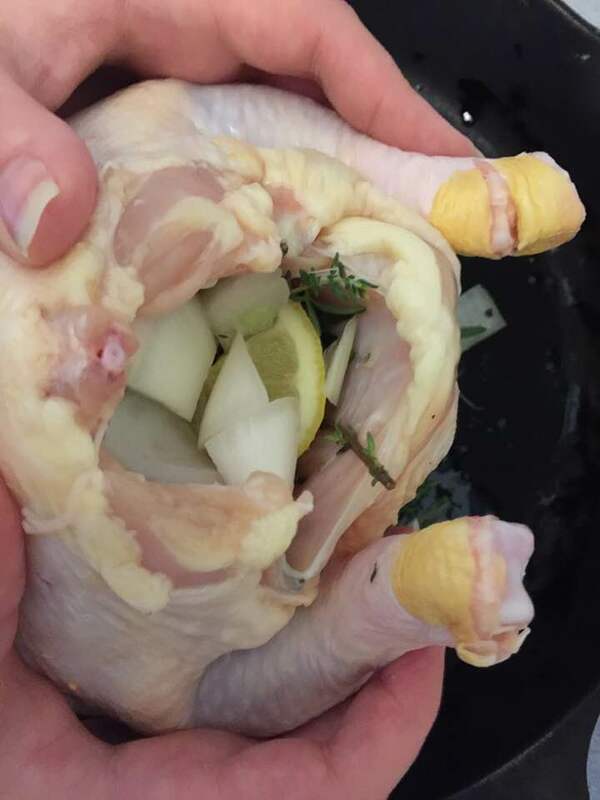 Shove the reserved aromatics (lemon, garlic, herbs, onion) in the chicken’s cavity. Place your chicken on top of the bed of herbs and veggies . Pour some olive oil on top of the chicken and season (aggressively) with salt and pepper. (Optional) I usually put a few pats of butter on the bottom of the dish with the veggies, and a tablespoon or so inside the chicken. It adds nice flavor and keeps it moist! If you don’t do dairy, you can leave it out, or sub more olive oil. Just make sure your veggies don’t dry out completely during the cooking process. Bake for 2 hours (I normally use a 5 pound chicken) or until internal temperature reaches 165 degrees. I have seen recipes that recommend a shorter cooking time, but it will depend on a variety of factors: the size of your chicken, your oven, ect. Just be sure internal temperature gets to 165 degrees Farenheit. If you don’t have fresh herbs available to you, try seasoning your chicken with Trader Joe’s 21 Salute seasoning. It has a mix of everything in it: herbs, lemon zest, pepper, ect. You can totally tie the legs with twine and get fancy like you see on the Food Network, but I usually don’t have cooking twine at home. Save the bones to make a homemade broth! I hope you enjoy this recipe! I’d love to hear from you. What’s your favorite side dish to have with roast chicken? Comment below!